Taking the name of Francis, the new Pope has brought a bit of the poverty-loving saint to the Vatican. 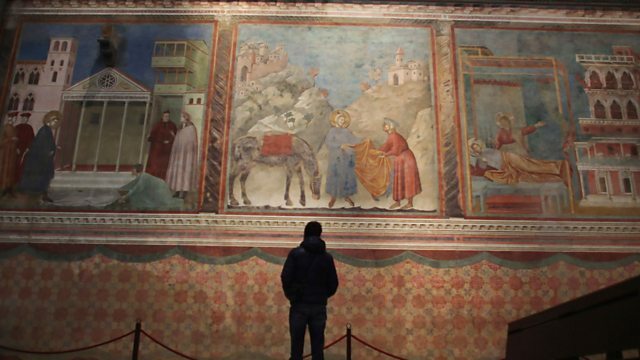 Heart and Soul has travelled to the Italian town of Assisi where St. Francis lived and died, to hear reactions there and find out about the enduring appeal of this saint. To appreciate the legacy of St Francis, in the town he took the name of, you may need to look high above you. It's painted into the walls and ceilings of the churches that pepper the Umbrian town. But his spiritual legacy was boosted when high above St Peter's Square, the new Pope was named as the first Pope Francis and the life of the 13th Century saint was evoked when ‘Papa Francesco’ credited him as his inspiration. John will hear how the wealthy Francis, the son of an affluent trader, gave up his wealth, stood naked before God and pledged his life to him and to rebuild his church and how he travelled, spreading the word of God in a bid to re-evangelise Christians and how that phrase has been used to describe the focus of Pope Francis for today's Church. He will meet the devotees of St Francis and ask what it means to them for the new Pope to take their Saint's name.